For New Years David and I spent a week in Colorado, starting in Denver then heading to our favorite snow town: Breckenridge. Last year David actually gave me a trip to Breckenridge as my main holiday present, and we had so much fun that we decided to ring in the new year there as well. This year we’re doing a ton of traveling, and wanted to symbolically start the year away from home. Little did we know that I’d get hit with a nasty flu, pretty much giving me only one healthy day in Breckenridge. I was able to make the most of said day though, spending a few hours snowshoeing then a few more hours making a delicious dinner in our studio condo. 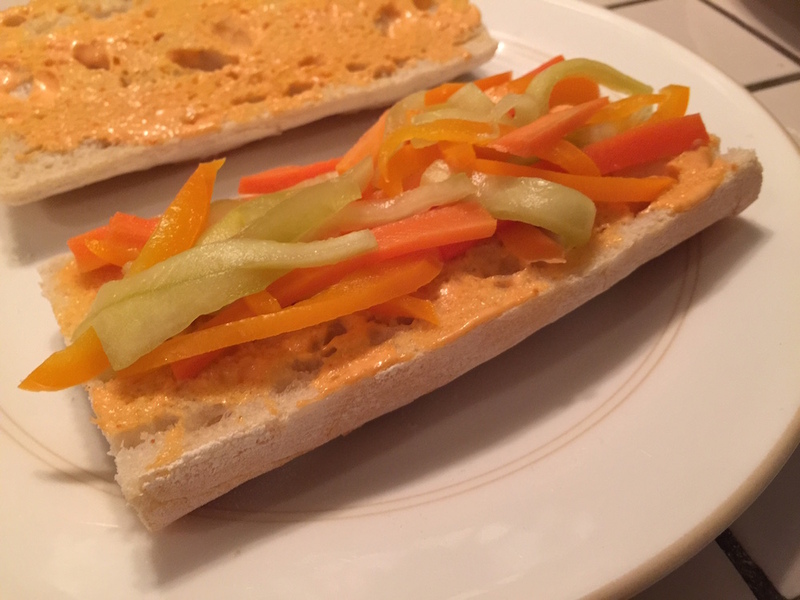 As luck would have it, a brand new Whole Foods opened up just a few minutes outside of town, so I was able to stock up on all the necessary ingredients to make these delicious tofu bahn mi sandwiches. 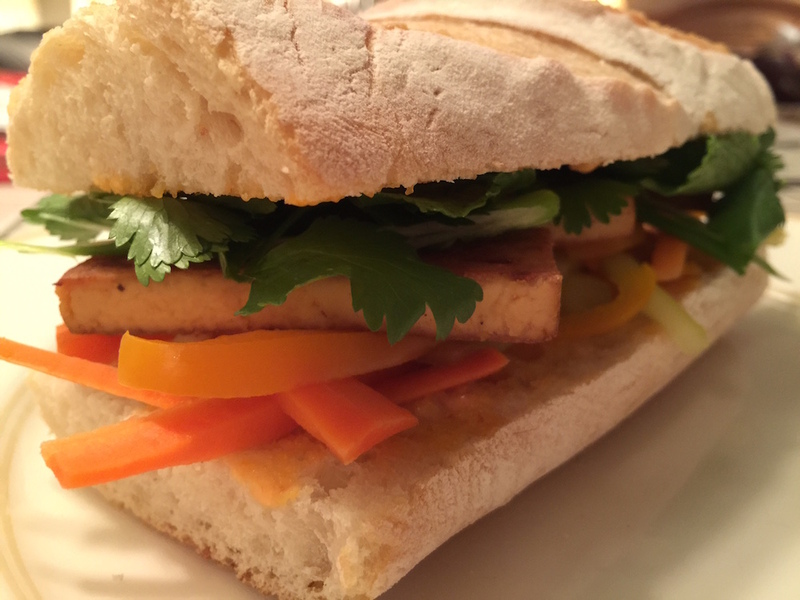 They’ve got a great flavor combination thanks to the pickled veggies, marinated tofu, and fresh herbs. Now I use a combination of mint and cilantro and I recommend you do the same, don’t just use one or the other. The cilantro gives you that citrusy herb taste, and the mint adds freshness that can’t be replaces. 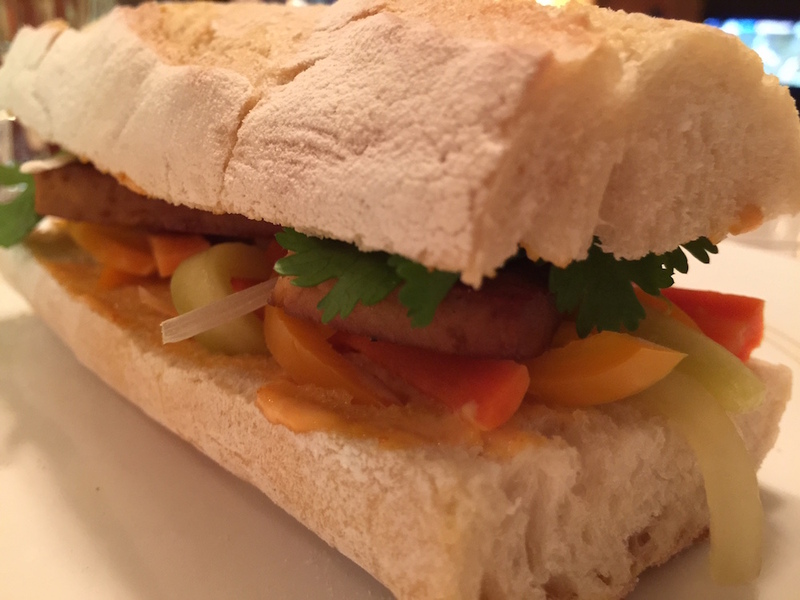 Here’s a shot of a finished bahn mi, notice David working in the background. 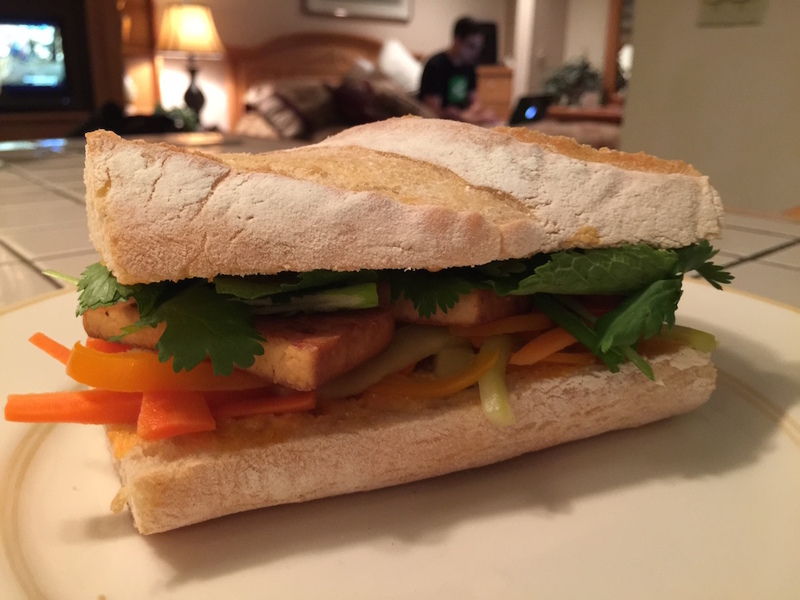 I am literally just about to call him over the enjoy dinner, and although he isn’t usually a bahn mi fan, David not only finished his first tofu bahn me, but then requested I make him a another. Luckily I had enough pickled veggies for both of us to have second helpings! Seriously, the secret is the mint and cilantro. 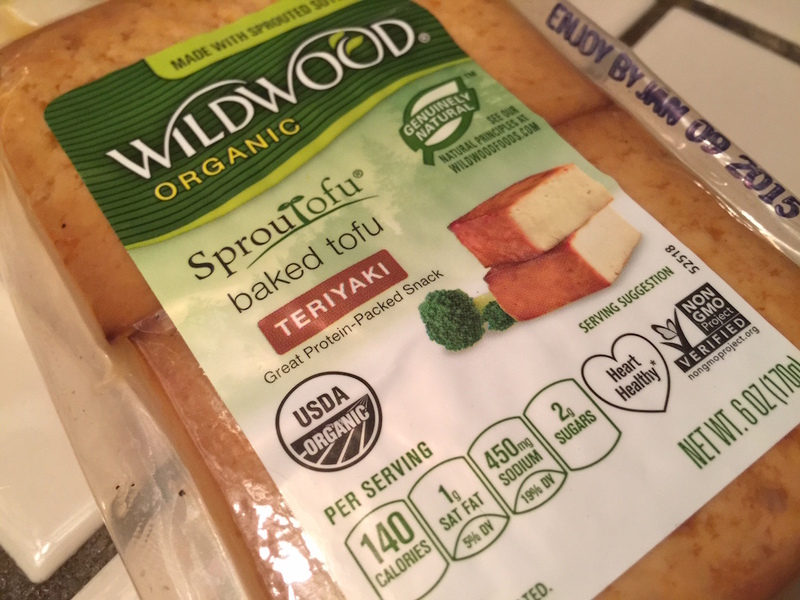 Heads up, I went with a tofu that was already pre-baked and flavored with teriyaki. 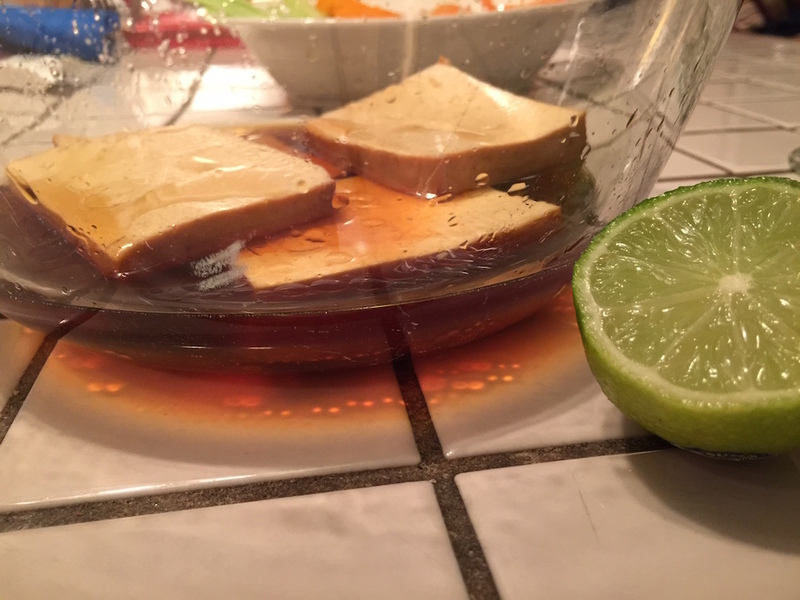 I still do a quick marinade to add even more flavor, but was able to avoid having to press and do a full marinade on the tofu. 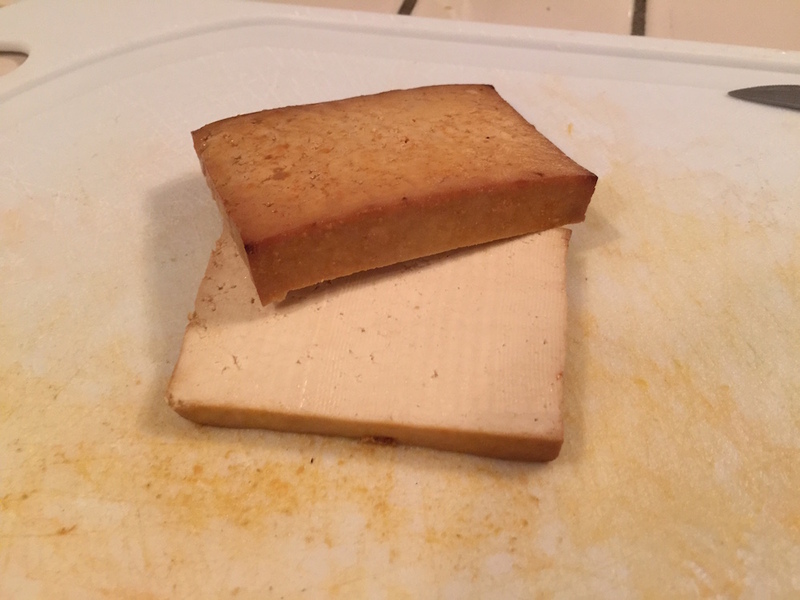 You could go with a regular tofu in liquid, but just allow an extra hour or two for the additional prep work. 1. 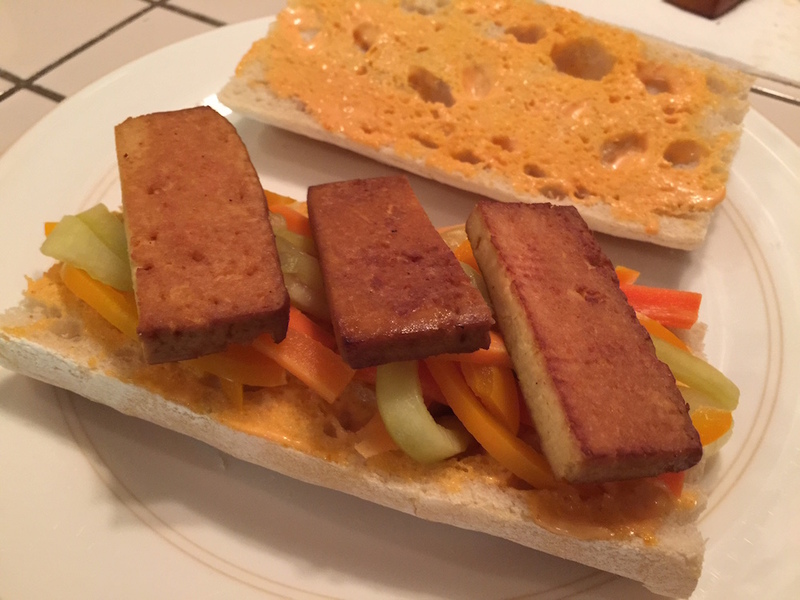 Start by slicing up your tofu and preparing the marinade. 2. Add a couple of tablespoons of soy sauce into a bowl. Stir in teaspoons of honey and sesame oil, along with the juice of half a lime and a splash of rice vinegar. Toss in tofu, then let sit for at least half an hour. 3. 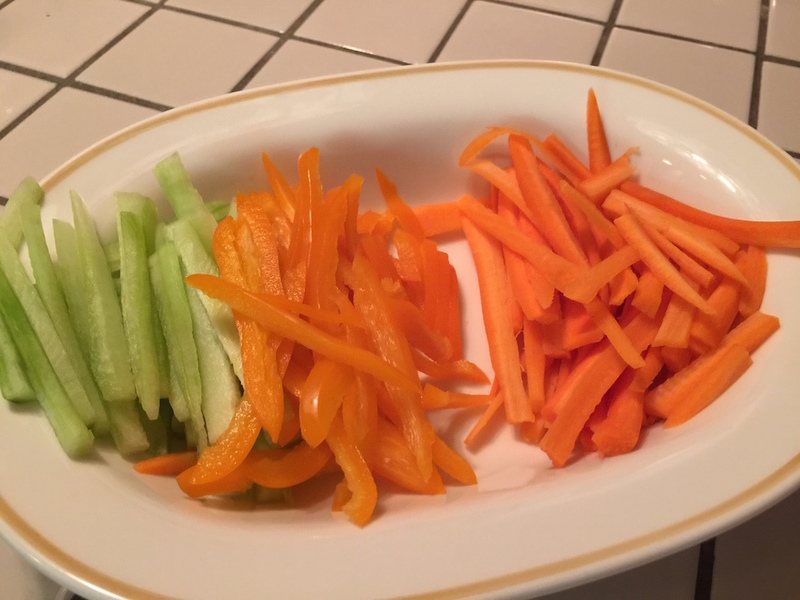 Slice cucumber, yellow pepper, and a few carrots into long strips. 4. 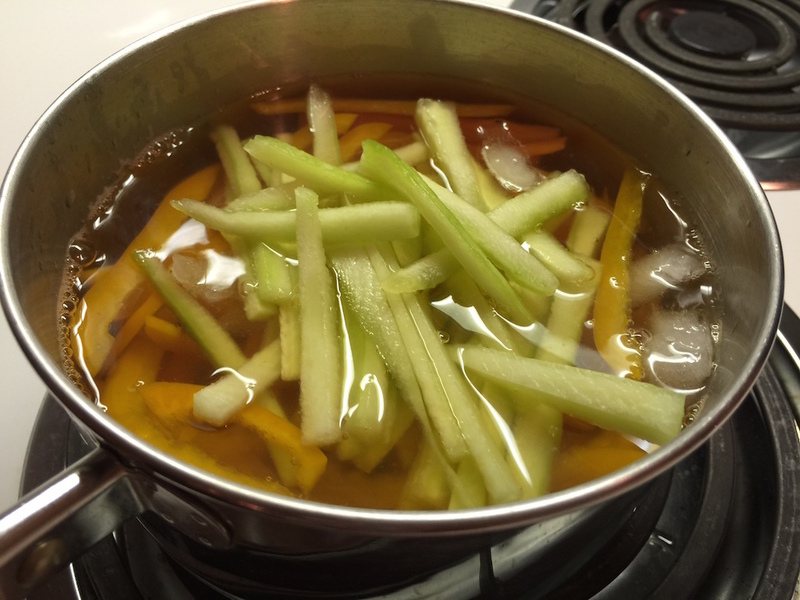 You’re going to do a quick-pickling of the veggies, so prepare your liquid by adding about a cup of rice wine vinegar, and a cup of water into a pan. Season with a bit of salt, pepper, and a splash of soy sauce. 5. 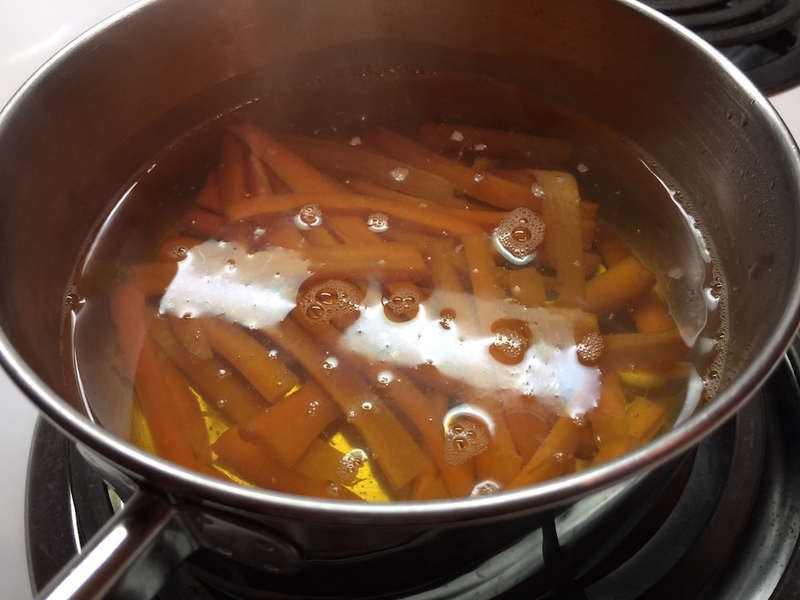 Bring to a boil, then turn off heat, and drop in your carrots. You’ll need to add the veggies one at a time because they all have different cooking times. The carrots go in first because they’re hard and need the extra heat to soften. 6. Wait about a minute then add bell peppers. 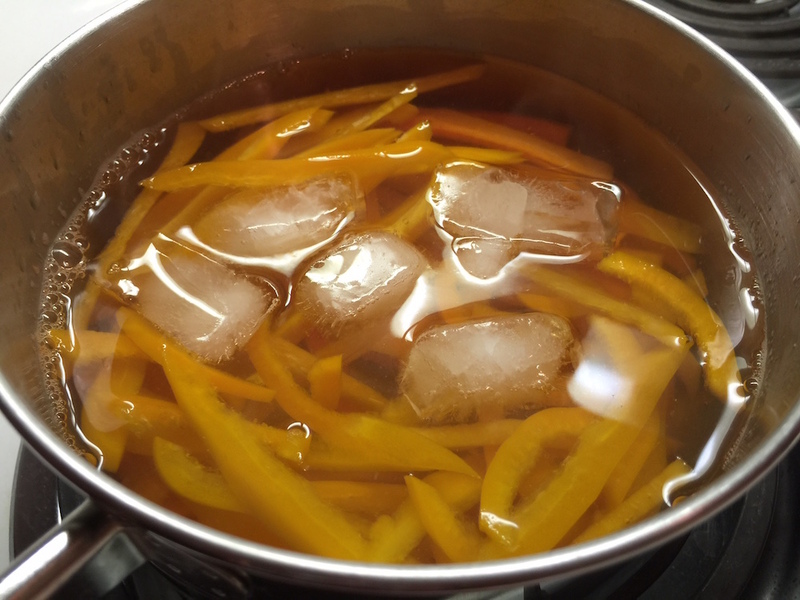 Let sit for another minute, then drop in a few ice cubes to lower the temperature of the pickling liquid. 7. Add cucumber slices, then cover and let sit for twenty minutes. 8. 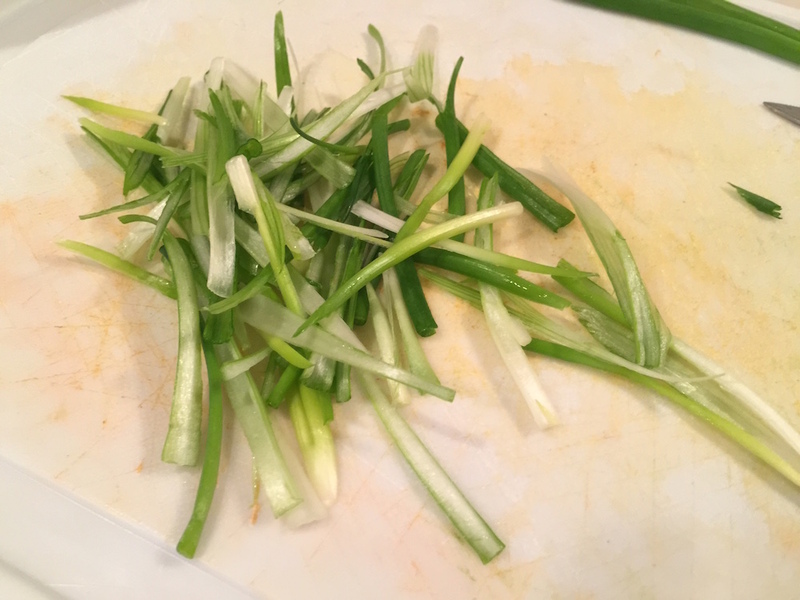 While you’re waiting prep your green onions and herbs. 9. 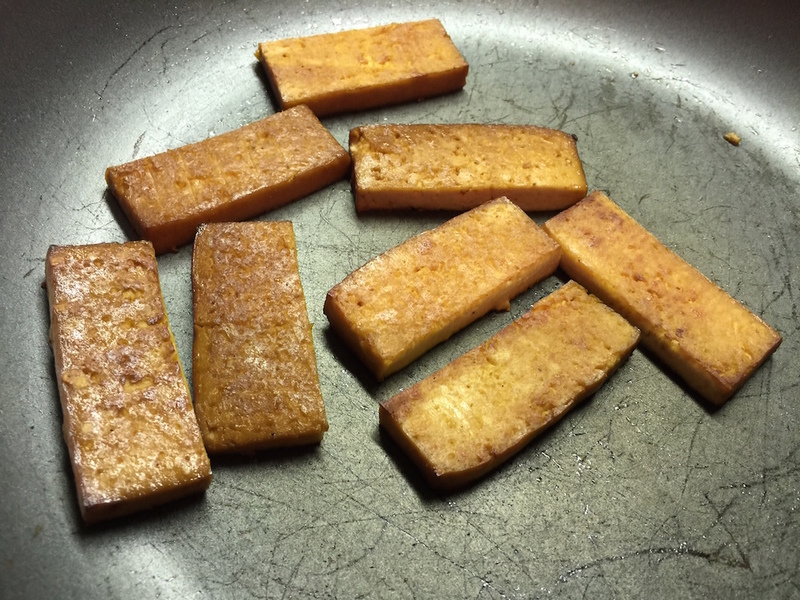 And sear tofu in a non-stick pan with sesame oil. Make sure to brown on both sides. 10. 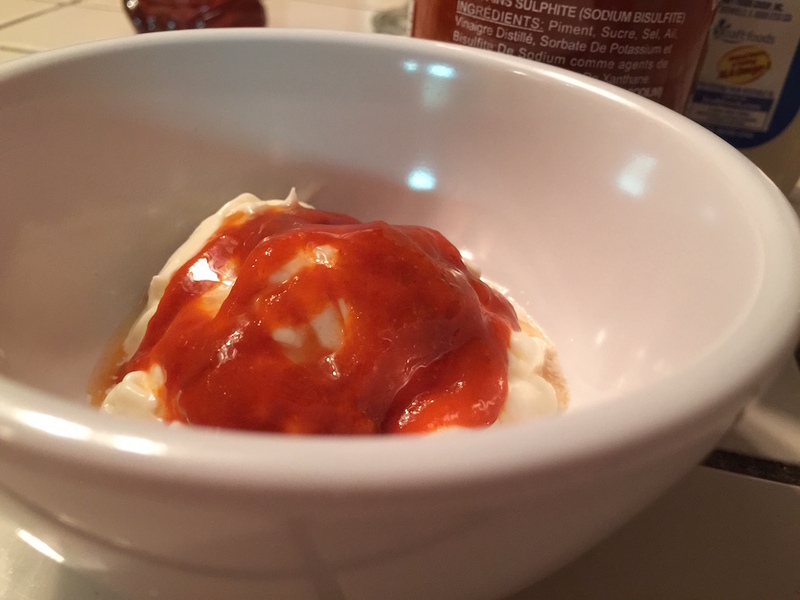 Combine a spoon full of mayo and a teaspoon of Sriracha. Stir then set aside. 11. Strain veggies, and rinse with cold water. 12. 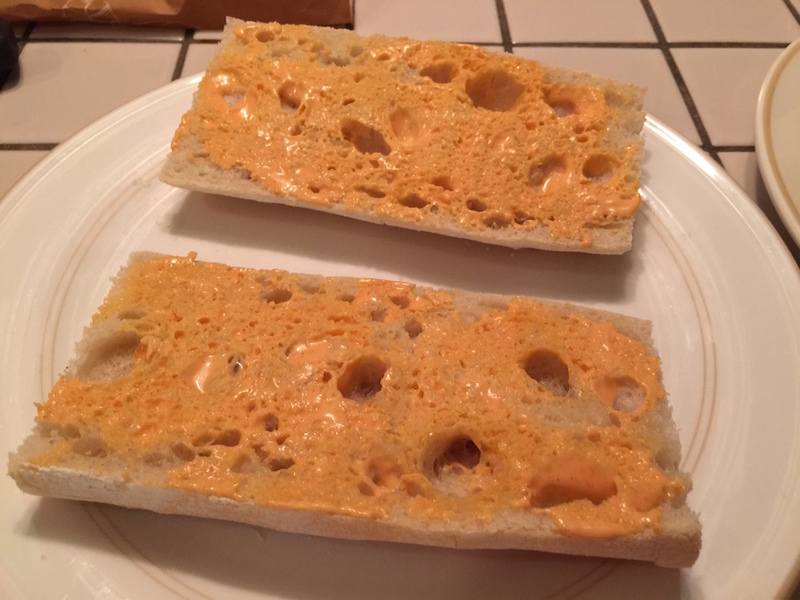 Slice your baguette and spread Sriracha mayo on both sides. 13. 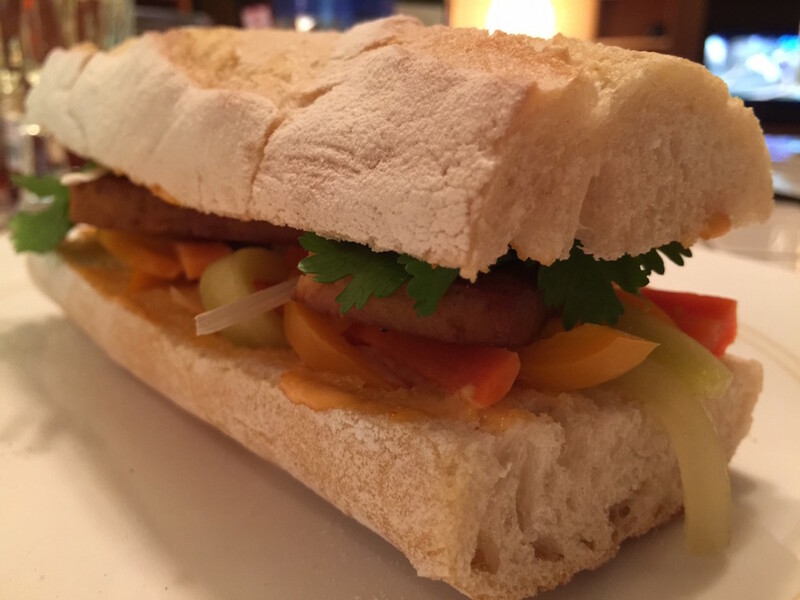 Build your bahn mi, starting with a layer of pickled veggies. 15. 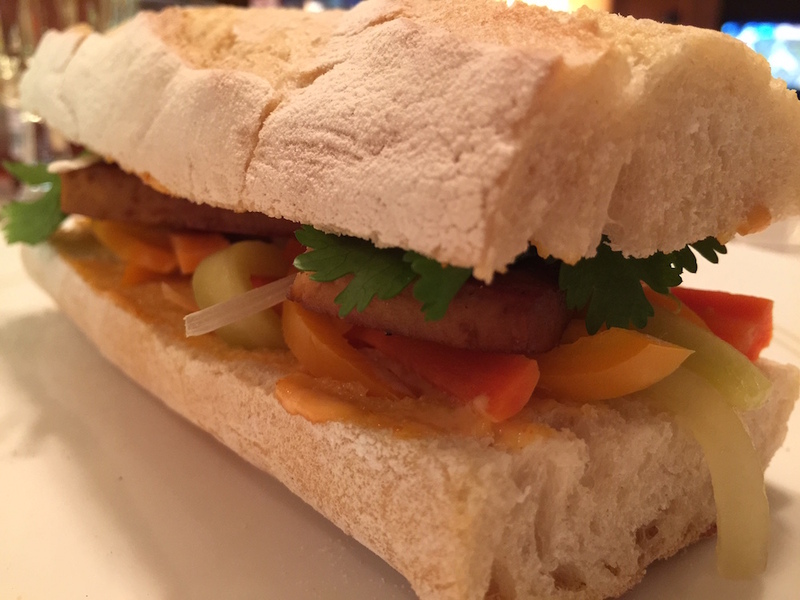 Top with herbs and green onions, then enjoy!